This column is two parts by necessity. You might wonder what part one has to do with the title of this column, but I will make it quite clear by the end of part two. There's been a great deal of excellent investigative reporting regarding the "Occupy Wall Street" movement that has now spread to cities across the U.S. People have been shocked at what they're seeing. Photos of a man defecating on a police car (yes, his drawers were down for the world to see) and a couple fornicating under the blankets on the side walk like we see dogs in the street. While it was a May Day rally, some have been shocked to see the photos of America haters holding signs like "From Wisconsin to Libya - Workers Unite for communism!" Not surprising the other America haters, the SEIU (Service Employees International Union) thugs are walking side by side with the communists. It's always been part of 'The Plan' implemented by the Communist International Party to infiltrate America's unions and the plan has been very effective because too many union members are ignorant of the forces working to bring down this country. Go take a look at the photos on this web site from Los Angeles where the invasion of illegals has all but sealed the fate for the rest of California. Look at the propaganda hyped by the brainwashed who have zero understanding of their own country's history (Not America): "Weren't you illegal in 1846? This is our land." Amazing that sign actually instructs you to remember the Treaty of Guadalupe-Hildalgo! What does that treaty say? "Under the terms of the treaty negotiated by Trist, Mexico ceded to the United States Upper California and New Mexico. This was known as the Mexican Cession and included present-day Arizona and New Mexico and parts of Utah, Nevada, and Colorado (see Article V of the treaty). Mexico relinquished all claims to Texas and recognized the Rio Grande as the southern boundary with the United States (see Article V). 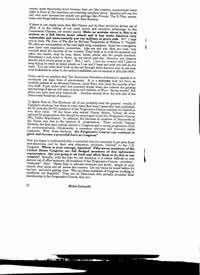 "The United States paid Mexico $15,000,000 "in consideration of the extension acquired by the boundaries of the United States" (see Article XII of the treaty) and agreed to pay American citizens debts owed to them by the Mexican government (see Article XV). Other provisions included protection of property and civil rights of Mexican nationals living within the new boundaries of the United States (see Articles VIII and IX), the promise of the United States to police its boundaries (see Article XI), and compulsory arbitration of future disputes between the two countries (see Article XXI)." If Mexicans have a problem with the treaty, they should take it up with their government. Of course they won't. The whole agenda is agitation, invasion and Reconquista of four American states. 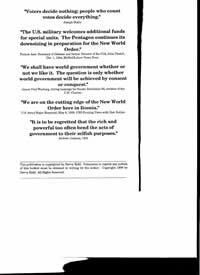 "The same year they wrote “The Program,” Communist architects and social engineers began to implement their plans for the globalist, communistic New World Order, commencing with the transformation of all humans into supporters of totalitarianism. Nikolai Bukharin had previously written “that the revolution's principle task was to ‘alter people's actual psychology.’” (Emphasis added.) In 1928 Bukharin stated that “one of the first priorities is the question of the systematic preparation of new men, the builders of [totalitarian] socialism.” In his book, Soviet Civilization, Andrei Sinyavsky states that the “idea of the new man is the cornerstone of Soviet civilization.” The “new man” is in fact the indispensable, fundamental basis of all totalitarian societies. Totalitarianism requires the support, approval, and fearful veneration of the masses; if the “new men and women” had not been created, totalitarianism would not exist today. "The Communists planned to create not only a new way of life, but new human beings. They sought to achieve not only the reconstruction of social and cultural institutions, but reconstruction of human beings. Communist totalitarianism has undergone tremendous growth over the past century only because it has “the support of a man of a new social and psychological type”—the “new communitarian (Communist) man.” A communitarian is a member of a communistic community. A communitarian adopts and advocates communistic concepts, such as a spirit of community, selfless commitment to community service, and the duty to work for “the common good.” The terms “Communist” and “communitarian” are synonyms and are interchangeable, but the word “communitarian” connotes a sense of community and a spirit of collectivism. In 1928 Communists formally adopted "
"Get control of the schools. Use them as transmission belts for socialism and current Communist propaganda. Soften the curriculum. Get control of teachers' associations. Put the party line in textbooks. "Gain control of all student newspapers. "Present homosexuality, degeneracy and promiscuity as "normal, natural, healthy." "Discredit the American Constitution by calling it inadequate, old-fashioned, out of step with modern needs, a hindrance to cooperation between nations on a worldwide basis. "Discredit the American Founding Fathers. Present them as selfish aristocrats who had no concern for the "common man." "Belittle all forms of American culture and discourage the teaching of American history on the ground that it was only a minor part of the "big picture." Give more emphasis to Russian history since the Communists took over. "Support any socialist movement to give centralized control over any part of the culture--education, social agencies, welfare programs, mental health clinics, etc. "Eliminate prayer or any phase of religious expression in the schools on the ground that it violates the principle of "separation of church and state." "The Los Angeles Unified School District has decided to impose a curriculum of pro-homosexual indoctrination. This Homosexual Education will remake every classroom to be more "tolerant and open." Students will be brainwashed into believing homosexual lifestyles are moral and correct. History courses will be rewritten to force in Homosexual and even transgender "role models." Even elementary school children will be forced to learn new "lessons" in favor of homosexuality -- all the way down to kindergarten." "Worldview Weekend President Brannon Howse says the NEA is also advocating multiculturalism. "Today we call it political correctness, but the real term is cultural Marxism. It's also multiculturalism, which is a denigration of the foundational Western worldview," Howse explained.....Howse agreed with Adams on the basic point. He says he's not surprised that the NEA would celebrate communism. "I'm appalled but not shocked because of the National Education Association's long love affair with communism," Howse said. "Most Americans are going to be shocked but this helps us understand who the National Education Association really is. The NEA is a group of radicals who are opposed to parental authority, opposed to accountability, and they're not for traditional education," Howse added. "They're not reading, writing and arithmetic. They are for a progressive, liberal, anti-American worldview and most of the teachers who pay dues to the NEA do not agree with the liberal stances of the National Education Association," Howse explained. Throughout its history, the NEA has historically been willing to ask for federal intervention in the nation's schools. The NEA web site reports that the teachers' union successfully influenced the federal government to create a federal Department of Education." Well, it's all coming home to roost. The "occupiers" on Wall Street to Denver to LA: products of the government's schools - "transmission belts for socialism".. I again refer to Toward Soviet America by William Z. Foster (free on line), page 104, The Rise of Socialism, continues ranting about workers rights and how wonderful the people of the USSR have it under communism. Pg 271 begins the pathetic crap spewed by those who hate freedom and liberty: The American Soviet Government: "When the American working class actively enters the revolutionary path of abolishing capitalism it will orientate upon the building of Soviets, not upon the adaptation of the existing capitalist government. Capitalist governments have nothing in common with proletarian governments..."
"Present day culture in this country is an instrument by which the capitalist class consolidates its dominant position. The prevailing systems of education, morality, ethics, science, art, patriotism, religion, etc., are as definitely parts of capitalist exploitation as the stock exchange. The schools, churches, newspapers, motion pictures, radio, theaters and various other avenues of publicity and mass instruction are the organized propaganda machine of the ruling class." Page 316 - and remember - this book was published in 1932: "Among the elementary measures the American Soviet Government will adopt to further the cultural revolution are the following: the schools, colleges and universities will be coordinated and grouped under the National Department of Education and its state and local branches. The studies will be revolutionized, being cleansed of religious, patriotic and other features of the bourgeois ideology. The students will be taught on the basis of Marxian dialectical materialism, internationalism and the general ethics of the new Socialist society." If you have not watched the outstanding DVD: Cultural Marxism, I highly recommend you obtain a copy, watch it, loan it to your family, friends and encourage your church to have a viewing day. Single copies; multiple copies discount. If money is tight, split the cost with two or three friends. A substantial number of writers, including yours truly, have been trying to inform and warn Americans for decades that communism isn't dead and in fact, it's alive and thriving in the U.S. thanks to the government's indoctrination centers they call public schools. "Soft" communism, socialism, is now the rage among useful fools who follow the other useful fools higher up on the food chain: elected public officials. The reason I brought up the facts above regarding schools and unions is because if you don't know your enemy, you cannot defeat them. "Rep. Dennis Kucinich (D-OH); Sen. Bernie Sanders (D-VT); Rep. John Conyers (D-MI); Rep. Keith Ellison (D-MN); Rep. Barney Frank (D-MA); Rep. Jesse Jackson Jr. (D-IL); Rep. Charlie Rangel (D-NY); Rep. Maxine Waters (D-CA); Rep. Henry Waxman (D-CA)"
Below are a few pages from my Blind Loyalty booklet first published in 1996 (second edition 1998) after I allegedly lost my primary election to Rep. Wally the Waffle Herger out in California. It deals with vote fraud; I asked only a fifty cent donation to cover printing, envelope and stamp. I retired the hard copy after putting out 700,000 copies. (Both my booklets are available on my CD). 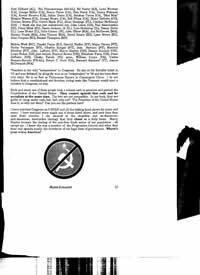 As you see on pages 22 & 23, I exposed the Democratic Socialists of America and members of Congress who belong to that subversive organization. Ron Paul apparently thinks there's no danger since he seems perfectly willing to put an open socialist, Dennis Kucinich, in a cabinet position. At that time, it was "only" 57, today the number is 70 members of the U.S. Congress are members of the Democratic Socialists of America; list here. While Kucinich was listed as a member in 1996, he's not on the current list, but his voting record is pure socialism and shame on the people in all 57 congressional districts who continue to vote enemies of our country back into office. Members of the U.S. Congress take an oath to uphold and defend the U.S. Constitution. Socialists are working feverishly to destroy it. With all due respect to AMERIPAC, the socialists and communists in this country aren't in sleeper cells, they're out in the open and in our face. Progressives are socialists and on the extreme side like Van Jones, they're communists. They push the poison of democracy (mob rule) all for "social justice" and tens of millions of Americans have swallowed it hook line and sinker. Products of the government's indoctrination centers: public schools. Even some alleged supporters of the Constitution buying into the stupidity of the OWS are calling to close all banks and begin issuing "social credit." Fools. Part II: The Venona Secrets, the occupiers and why sheriffs and state legislators who still care about this country and our Constitution had better "get it" soon about the constitutional militia and the hell with worrying about their next term or the corrupt media. For part two click below. The Disastrous Yields of Socialism By Sheriff Jim R. Schwiesow, Ret. Millions of Americans have viewed this rancid film. Too many have bought its message of a Godless communist world. 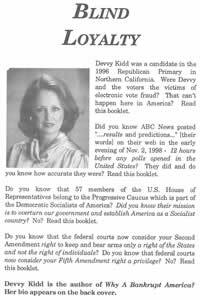 Devvy Kidd authored the booklets, Why A Bankrupt America and Blind Loyalty; 2 million copies sold. Devvy appears on radio shows all over the country. She left the Republican Party in 1996 and has been an independent voter ever since. Devvy isn't left, right or in the middle; she is a constitutionalist who believes in the supreme law of the land, not some political party.